When it comes to manufacturing or construction equipment, regular and preventative maintenance is an important aspect of keeping your machines working at optimal condition. We understand how important it is for a company to take good care of their machinery, and our team is well equipped and highly skilled to perform a wide range of hydraulic service and repair jobs. Our quality services are geared towards lowering the risk of recurring malfunctions. Despite the best planning and careful operation, equipment can break down due to a range of reasons. We understand how crucial it is to get your machines back up and running, which is why we offer on-site and field hydraulic ram repairs and other services, so you can resume your work as soon as possible. 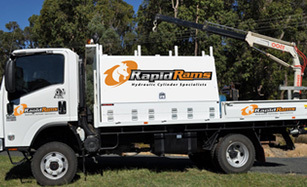 Rapid Rams mobile service includes inspections for mobile plant and industrial equipment. Call us now to discuss your requirements. Rapid Rams mobile service includes inspections for mobile plant and industrial equipment call to discuss your requirements.